Recently, ELTF briefed Mr Hansraj G Ahir, MP from Maharashtra about the problems faced by the students and parents on getting education loan and interest subsidy from the banks. Mr Hansraj G Ahir is a well known BJP MP and he is the whistle blower of coal scam in the Parliament. Mr Hansraj immediately forwarded our representation to Dr Manmohan Singh, Prime Minister personally on 4th Septeber 2013. 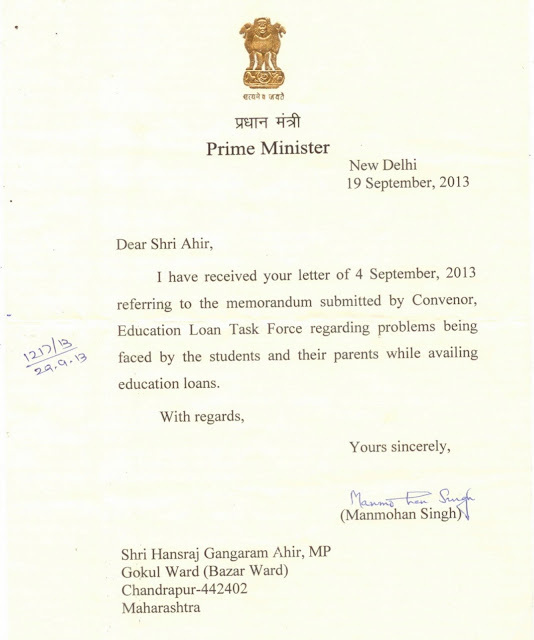 Prime Minister has personally acknowledged the representation on 19th September 2013. In the representation, we have brought out various issues faced by the students and parents, while approaching the banks for education loan. We have also mentioned that the banks are not implementing the interest subsidy scheme properly. We have indicated to the Prime Minister that many of the eligible students are not denied interest subsidy either fully or partially. As per the Government of India Scheme, 100% interest subsidy is provided to the eligible students. That means the eligible students need not pay even a single rupee by way of interest to the bank till the end of moratorium period. (Please visit FAQ section of this site for more details). ELTF has also demanded CAG/RBI audit of all the education loans to ensure that all eligible students have been granted with interest subsidy fully. Now Prime Minister has forwarded the representation to Ministry of HRD, who administer the interest subsidy for their comments. Now Ministry of HRD is investigating into the matter. We have found that the Banks are misleading the students like this. (d) Banks claiming full interest subsidy from the Government and also recovering interest from the students. All the above actions are in violation of the Government guidelines. Now Ministry of HRD is investigating into the matter. If the students feel that they are eligible for interest subsidy and are misled by the bank managers, they can straight away report to the Chairman of the concerned bank and also to RBI for necessary action. Please also read the IANS Story published in various media on this issue. The Comptroller and Auditor General (CAG) or the Reserve Bank of India (RBI) should audit the manner in which the banks operate the interest subsidy scheme for their education loans, says K.Srinivasan, convenor of Education Loan Task Force (ELTF). "Based on the complaints received by ELTF, many students have not been getting interest subsidy from many banks. There are bank managers who even fob off the borrowers denying any such interest subsidy scheme," Srinivasan, a former banker, told IANS. He said Canara Bank is the nodal agency for setting the bank's claims under the interest subsidy scheme for a fee and it would claim the amount from the human resource development ministry. Srinivasan said under the interest subsidy scheme, the centre would reimburse the banks the interest due on the loan amount till the end of one year from the date of completion of the course, or six months from the date on which the student lands a job after his course -- whichever is earlier. The centre would reimburse the interest to those students whose parental income is less than Rs.450,000 per annum, and on loans which are available only for professional and technical courses and not for arts/science, and students of diploma course, Srinivasan said. Citing union budget documents, he said during 2011-12, Rs.697 crore was allotted for the loan's interest subsidy. Between 2012-13 and 2013-14, Rs.800 crore and Rs.1,100 crore have been allocated. "I understand the Rs.1,100 crore allocation for this fiscal has already been exhausted," he added. According to him, the total education loan portfolio for the banking sector as on March 31, 2013, is around Rs.53,000 crore in around 25 lakh accounts. Under the Indian Bank's Association (IBA) guideline loan repayment could be done over a 10-15 year period. Banks also shame the students by pasting their pictures on the branch notice boards when they default on dues. "We appreciate the interest subsidy scheme, but the way in which the interest subsidy is managed needs to be thoroughly audited by CAG or RBI," said the ELTF convener.